Practical, popular and personalized, drink coasters and matches are perfect ideas for the ultimate table top or bar accessory. Finding a unique party favour is easy when you shop at Weddingstar. 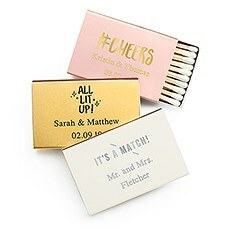 These personalized matches are a great way to add a custom touch to your wedding or special event while staying right within your budget. This is an affordable yet fun way to add a little of your own personality into your event. And with so many colours and designs from which to choose, it's easy to get a set of custom matchboxes or matchbooks that matches the rest of your event décor.All Kinds of StylesThe great thing about choosing to get your custom matches from Weddingstar is that the design possibilities are endless. You can choose from so many different colours and designs that it's easy to capture the feel of your event in just one simple favour. Pick out the background and font colours that suit you, then pick from our huge collection of formats and logos. You can find designs for all kinds of events, including graduations, weddings, anniversaries, birthdays, New Year's Eve parties and more. You can also add your own personal details to the design, like your names or your event date.Practical & PopularThis small yet memorable favour is easy to offer to guests by handing them out individually, placing them around each table or offering them in a bowl at your bar. Custom matchbooks and matchboxes are a classic favour, but you can give them a modern spin by ordering one of the contemporary designs from Weddingstar. And because they are so budget-friendly, you'll be able to get plenty of personalized matches to hand out at your event. 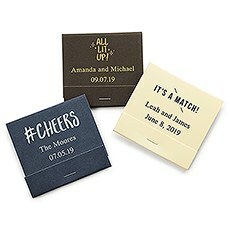 Make it a memorable celebration by choosing these personalized matches from Weddingstar.